It turns out White House Press Secretary Sean Spicer may not need a larger press room after all. On Wednesday, Spicer welcomed four new reporters into the already sardine-packed James S. Brady Press Briefing Room with the help of video chat application Skype. Spicer’s virtual addition to the daily press briefing, also known as the “Skype Seat,” allows for additional reporters from around the country, who are not able to attend the briefings in person, to ask Spicer a question or two remotely. Principal Deputy Press Secretary Sarah Huckabee Sanders said reporters and viewers can expect Spicer to host Skype about four Skype questions twice a week. Those who do not work at a credentialed Washington news organization and want to ask Spicer a question, Sanders said, must first send an email expressing interest. Spicer announced his plan during the first week of briefings. “You get opinions people might not ask from just in Washington,” Sanders said. 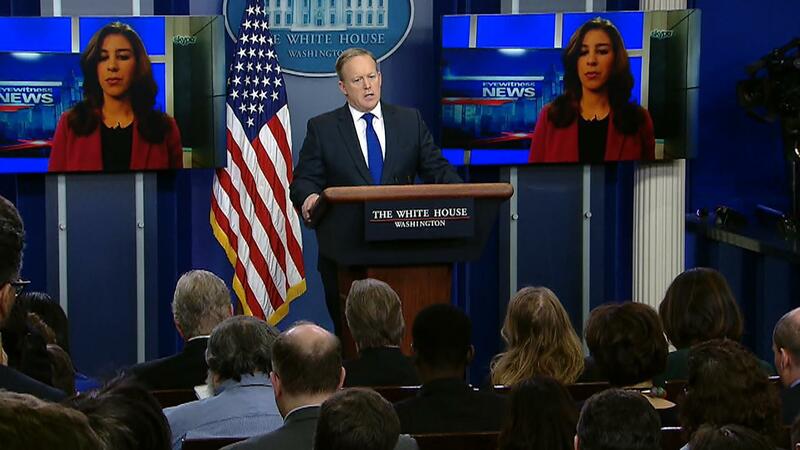 Spicer handed the first Skype question to Kimberly Kalunian of WPRI in Providence, Rhode Island, whose live image was broadcast for the rest of the room to see on two video screens above and behind Spicer. Kalunian asked about President Trump compiling a list of sanctuary cities and the depletion of federal funds forcities refusing to comply with the president’s immigration executive order. Spicer then preceded to weave the Skype questions between those delivered by reporters physically present in the room. The second Skype question came from Natalie Herbick of Fox 8 in Cleveland about 20 minutes into the conference. Herbick asked about the president’s campaign promise of revitalizing inner cities. The third Skype question was granted to conservative talk show host Lon Larsen in the thirty-second minute. He asked Spicer about the federal government’s ownership of roughly 25 percent of land in the U.S, and what plans, if any, the administration had to fully utilize the country’s natural resources. Finally, in the last Skype slot towards the end of the conference, Jeff Jobe of Jobe Publishing in Kentucky asked Spicer about ending regulations for the coal industry. “[Donald Trump] moving fast on executive actions…gives my state hope,” Jobe said. On whether the questions coming from the Skype Seats were “softballs,” Garrett said it didn’t matter. Sanders said that the next Skype session will take place on Friday.